Welcome to the next issue of China x Cleantech, our December 2018 edition. The year has closed, but let us review the final interesting cleantech developments from China last year. China is changing rapidly. In order to aggregate and summarize the highlights, we publish a monthly China × Cleantech feature as an article here on CleanTechnica as well as on the “Future Trends” section of our website (link above). Here’s the previous report in case you missed it. Tesla looms large in Chinese EV market news — the coming Model 3, Gigafactory 3, trade wars, and price cuts are trending across the internet. CleanTechnica is no stranger to these topics, so let us review what has been written here. Tariffs were the biggest news in December. Steve Hanley wrote that Tesla announced it would reduce prices on the Model S and Model X in China. This decision was in response to the Chinese government’s decision to reverse the decision to have a 40% tariff on cars imported from the USA. Steve added that CNBC is indicating that this decision is temporary. Read more here on CleanTechnica. Before the details on the temporary reversal, Steve Hanley wrote about the impacts of this trade war on the stock market and Tesla’s plans in China. Zachary Shahan introduced an interesting comparison between the Tesla Model 3, BMW 3 Series, Mercedes-Benz C-Class, and Audi A4 that might prove to be highly disruptive to the sales of those other luxury automakers. 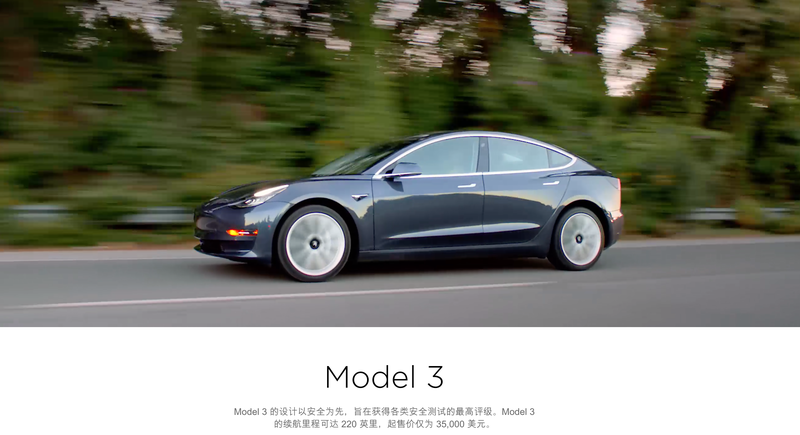 Vincent provided details on the Chinese market for luxury sedans, and from that information, it can be seen that the Model 3 is extremely competitive. Read more details, context and information here on CleanTechnica. Zachary Shahan has long discussed the ongoing impact that the Tesla Model 3 is having on the Canadian and United States car markets. Looking forward towards 2019, he speculated about possible impacts that the Model 3 will have in Europe and China, including a “forecast” of potential Tesla Model 3 demand and a rundown of Gigafatory 3. Jose Pontes reported on the sales of electric cars in China for the month of November. The data showed more than 140,000 registrations in November, which is up 59% year over year (YoY). When extrapolating for December sales, that would bring the total sales in 2018 to ~1 million plug-in sales for China alone. Jose provides a more detailed analysis in his article including lists of the most popular electric cars. Chanan Bos reported on the news that Lithium Werks, a lithium-ion battery manufacturer headquartered in the Netherlands, was partnering with the Chinese Zhejiang Jiashan Economic and Technological Development Zone Industry Corporation in October to build a gigafactory in China. In December of 2018, they announced that construction will start in 2019 and the initial annual production capacity will be 8 GWh. This will make it the first European company to build a battery gigafactory in China. Steve Hanley reported on the news that China is going to add large amounts of stationary battery storage to its grid to combat curtailment and provide grid frequency response in 2019. With both lithium-ion batteries and flow batteries being part of the plan, Steve highlighted two projects in China and their benefits and drawbacks. CATL, a leading Chinese battery producer, has set up a subsidiary in the United States in the city of Detroit, with aims to build ties with American automakers and develop products and services for the American automotive market. The USA subsidiary is CATL’s fourth subsidiary — it already has subsidiaries in Japan, France, and Germany, the latter of which being where CATL is building a battery factory to supply BMW. CATL wants to provide all automakers with batteries, and this is just one of its efforts to accomplish this goal. 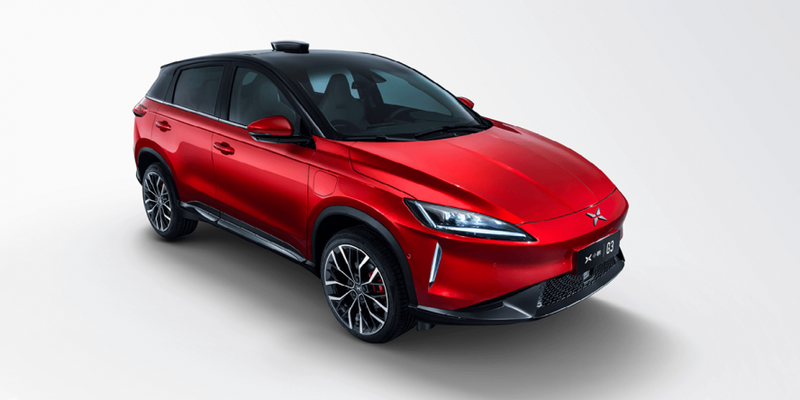 Xpeng, one of many Chinese EV startups, has started selling its electric G3 SUV in China. The G3 has a reported range of 365 km (227 miles) NEDC and a cost of 150,000 RMB ($21,500) after subsidy. The G3 is inspired by Tesla vehicles and has many features and style choices similar to Tesla’s, which is understandable since Tesla has had a massive impact on creating the present zeitgeist in the automotive market (electric, autonomous, high-tech, futuristic). 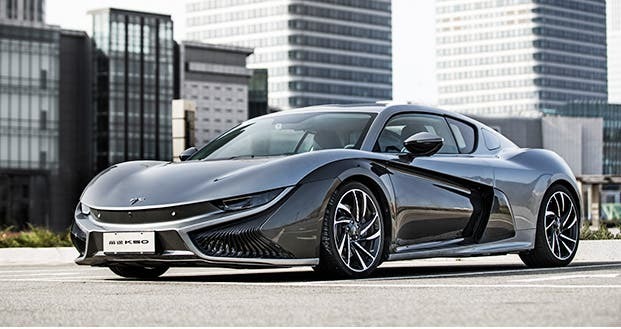 Nicolas Zart reported on the news that Qiantu (China) and Mullen Technologies (USA) are going to release the K50 electric supercar in the USA by 2020. Nicolas, who met people from both companies, reported that Mullen Technologies will be manufacturing the K50 and did the homologation process. For more details, including pictures of the K50 and details on Qiantu’s future plans, read Nicholas Zart’s article at CleanTechnica. JAC and Volkswagen in November signed a memorandum of understanding to jointly develop an electric vehicle R&D centre. In December, they broke ground on the site. The joint venture, JAC Volkswagen (江淮大众), was established in December of 2017 and is developing Volkswagens cars for China. 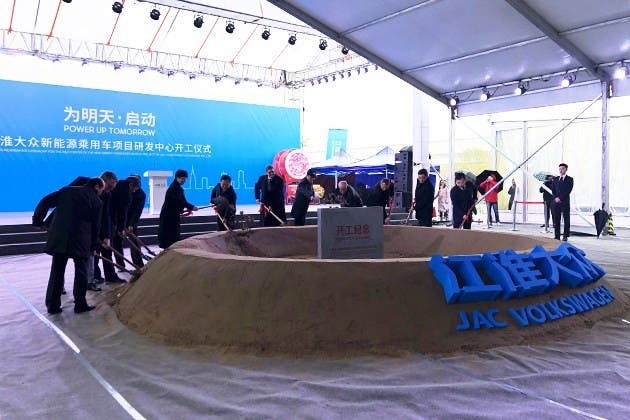 This site is not the first cooperation between JAC and Volkswagen in EV development, just the next step in both companies’ electric vehicle development. See more pictures and read more at EV Partner. The Chinese electric pickup truck market is starting to pick up steam. In October, I reported on two pickup trucks being listed on the market. Now we have gotten news that two more pickup trucks are getting ready. It looks like 2019 is going to be an interesting year for electric pickup trucks in China. JAC has officially revealed the JAC i3-T330, with a 265 km (164 miles) NEDC range and peak torque of 330 NM (Newton meters) — the peak torque is probably where they got the name. See pictures at EV Partner. Foton Auto has revealed its own electric pickup truck based on an already existing pickup truck. It has 350 km (217 miles) of NEDC range. This is expected to be a work truck. All Chinese pickup trucks are targeted towards working person requirements, and unlike other markets, they do not have high-end trims — although, that is logical for a working truck. Electric logistics sector news in China is dominated by light- and medium-duty electric trucks, because they are the most common and have the highest number of companies developing and selling them, but that doesn’t mean China doesn’t have heavy-duty electric trucks. I researched the market earlier in 2018 and interesting things are happening. CAMC completed its first batch of heavy-duty electric trucks, with a range rating of 150 km (93 miles) NEDC. 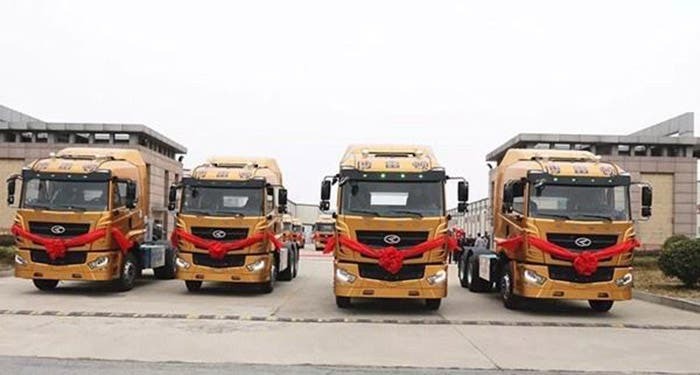 The batteries are provided by CATL and the company attributed bringing the truck to market to the “blue sky defence war/蓝天保卫战,” China’s policy to reduce air pollution, which requires logistics to move towards electrification or rail transport. While the range is not great, it does meet certain logistics scenarios, and hopefully we will see China create more long-range trucks in the near future. HOWO (China National Heavy Duty Truck), which is the third largest manufacturer of heavy-duty trucks, showed off 24 new trucks at its year-end conference, including the pure electric “HOWO T5G 220,” which is a heavy-duty truck designed to be a “sprinkler truck” — a truck designed to spray water onto the roads and into the air to combat air pollution and dust. With batteries provided by CATL, the truck has a range rating of 200 km (124 miles) NEDC, which is fine for its low-speed city driving work schedule. The dual DC charger offers a 1.5 hour charge. The battery, which is from CATL and is reported to be a “world leading battery,” is explained as follows: each battery pack has 29.26 kWh of energy capacity and the vehicle’s total energy storage capacity is 242 kWh. For pictures and details, head over to the EV Partner article. Finally, to end on some less than positive news, China is one of the global leaders in the expansion of coal power plants, helping lend large amounts of money to countries around the world to develop coal power plants even when financial data and science might indicate that such investments are not the best for the planet or long-term return on investment. For more details, read Joshua S Hill’s article here on CleanTechnica. See our previous China × Cleantech reports for more info from the red giant. Subscribe to the China X Cleantech newsletter to not miss a beat. Tim Dixon When not researching the Chinese electric car market, I am teaching in China. My interest in sustainable development started in University and it led me to work with Tesla Europe in the Supercharger team. I'm interested in science fiction, D&D, and travel. You can follow me on Twitter @TimDixon3.